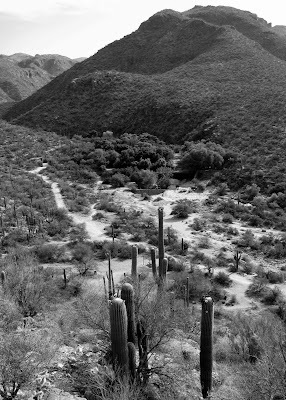 So this morning I got up early and went to Sabino Canyon, skipping breakfast. ...but as beautiful as they are, the saguaros themselves take on a comical look, with the tips of their crests and arms holding these bouquets, eh? In a few minutes, my wife and I are going to go meet someone; we might be moving this summer, and this person is wanting to rent out their townhome that's located practically at Sabino Canyon's 'front door!' S. and I are already smitten with the idea of having all THIS (the scenery of the above photos) just a ten minute walk from our potential front door!